Stuff Points: Earn 341 points when you buy this stuff. The ultimate in rustic luxury and cozy comfort, this high quality comforter is made in the USA using sustainable wool, and organic cotton. It's similar to high end down comforters when compared for warmth and weight, but it's more affordable, and has added benefits that down can't offer. You'll find it to be incredibly cozy, amazingly soft, and surprisingly lightweight, and you'll love the way it looks on your bed as well as how it feels against your skin. Each one is made by hand, and thanks to stitching that spans the entire perimeter and tufting at the center, the filling will never move around or become clumpy with use. By using only the cleanest, most high quality wool available, the internal batting remains totally chemical free from sheep to bed, but also free of unwanted contaminants like dirt, dust and vegetable matter. By covering the natural filling with a 300 thread count, organic sateen cover, it completes the package, and leaves you with the ultimate way to stay warm at night. With three different weights available, you are sure to find the perfect thickness to match your climate and body type. Top Quality. The ultimate in quality and luxury, this product can last for decades. Top of the line fabrics cover the exterior while hand-tufted batting fills the inside. The super soft, and perfectly warm result is one that will improve any bed, and because it's made so well, you can be sure it will look great and last for years. Breathable. Cool in the summer and warm in the winter, wool is naturally more breathable than other fillers. It will help to regulate your body temperature to ensure a solid night's sleep. Secure. Unlike down and other options, the batting in this one will remain in place because it's one solid piece, and it's also stitched in place for added security. Never worry about it losing shape or getting clumpy. Natural. It's not concocted in a lab, or mass produced in a factory, it is grown naturally. Wool is far superior to man made fillings when compared for quality and durability, and when snuggling up, your body will feel the difference too. Anti-Microbial & Anti-Bacterial. Unlike other fillers from nature, this one resists bacteria growth and microbial build-up. Rest in comfort, but never worry about harm from undesirable germs and yucky stuff. Dust Mite Resistant. Microscopic bristles on the surface of each wool fiber make it impossible for dust mites to move in. If you are regularly irritated by mites, or if you are allergic, this comforter is the perfect choice. Fire Resistant. Acting as a natural retardant, wool will not catch on fire like other materials commonly used. Sleep comfortably and safely when you wrap up with this instead of other options. Renewable and Sustainable. Down comforters rely on plucked feathers, and synthetic versions rely on petroleum products and other resources that are not environmentally friendly. In order to acquire the filling for this one, a sheep gets a haircut. With time, the coat will grow back, and there is no harm to the animal. 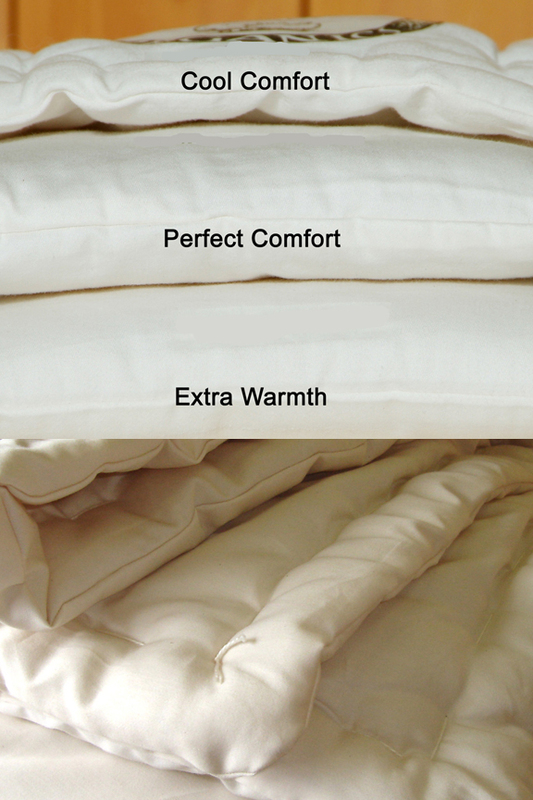 Many factors go into choosing the ideal thickness for your new comforter. You should take into account your geography and average body temperature, but you should also think about other factors like whether you are generally cold or hot, if you sleep with another person, or if you will be using other bedding in conjunction, or just the comforter alone. Most people tend to choose the mid-weight option, but to get a better idea of which weight is best for you, take a look at the info that follows, and decide which of the three weights is ideal in your case. Cool Comfort - Although it's the thinnest, it's not what you would consider thin, and is actually equal in thickness, or thicker than many comparable products found in department stores. This would be great for anyone, but those with hot bodies, or those living in warmer climates will definitely want to choose this option. For folks with mild winters, and the desire to pile up multiple blankets, this is also the perfect choice. Perfect Comfort - Because it's right in the middle, this weight is the most popular choice. It works well with more than one person in the bed, and it can be used year round in most climates. In extreme cold, you may find the need for an additional blanket with this option. Extra Warmth - If you get cold easily, r if you live in the tundra, you'll want to choose this extra thick version. It's perfect for people that sleep alone, or for anyone that like to snooze under a mound of blankets. Never worry about drafts or winter air when you have this thick layer on your bed. Dimensions Twin: 68" x 86", Full/Queen: 86" x 86", King/Cal King: 100" x 86"
Thickness Varies - Choose from cool comfort, perfect comfort or extra warmth. Outer Material 300 TC organic cotton with sateen finish. Center Tufting Yes. Hand stitched around the perimeter and tufted in the middle to prevent movement and allow washing. Transform your bed into the softest and most cozy place on Earth. 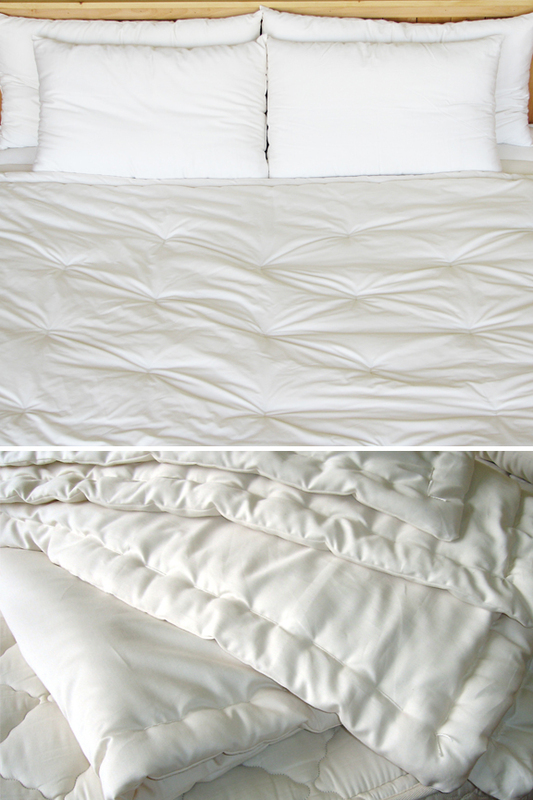 Premium quality materials, and hand stitched construction ensure a luxurious cover that would improve any bedroom. Sleep better than ever, and never worry about chemicals or synthetics that may be irritating. Order Yours Today!